If you haven't signed the club waiver of risk already, please bring a signed copy to the game where an admin will accept it. You CANNOT PLAY until you sign this wavier. (an admin will bring extra copies to the field). For effective carpooling we will be meeting in the Buffalo Wild Wings (211 Prices Fork Rd) parking lot at 9:30 AM. We would appreciate if those planning on driving could help with shuttling players. The aim is to be at the Caldwell Fields parking lot at 10am. Eye protection is REQUIRED while a game is in play. For safety reasons we require all eye protection to be ANSI rated (shatter resistant) and to have some sort of restraining strap to keep the glasses or goggles on your face. Bare minimum is shooting glasses with retention strap, however we recommend some form of full seal around the eyes such as goggles. Chem goggles, eye glasses, non-shatter-resistant sunglasses, etc. cannot be used. Depending on attendance we may not have enough loaner eye protection so if you can provide your own/extra please do so. We will be playing in the woods. It's hilly and dirty and full of things that like to poke holes in clothing. Please be mindful of this when choosing your outfit. Try to wear shoes appropriate for hiking. Pants with cargo pockets are helpful. As a rule of thumb, don't wear anything into the field that you'd care to lose. The bugs aren't terrible, but bug spray certainly helps. BRING WATER! There's no plumbing out there, and hydration is absolutely necessary for safety reasons. We do not require full face protection for airsoft and many players choose to not use it, though we do caution that face shots happen on occasion and are uncomfortable. A balaclava, shemagh, face wrap, bandanna, or scarf can help protect your face from stinging shots. Be prepared to carry everything with you for a 15 minute walk. If you are bringing airsoft guns make sure to have them covered so that no one can see them. Either use a gun bag or wrap them in something securely like a jacket that is tied off. We don't want any complaints coming back to the Rangers or to Law enforcement. We are doing great so far. Let's keep it that way. Please do not litter the field or leave belongings. We have been granted permission to use this field by park rangers, and we must maintain our integrity with them, and our environment. 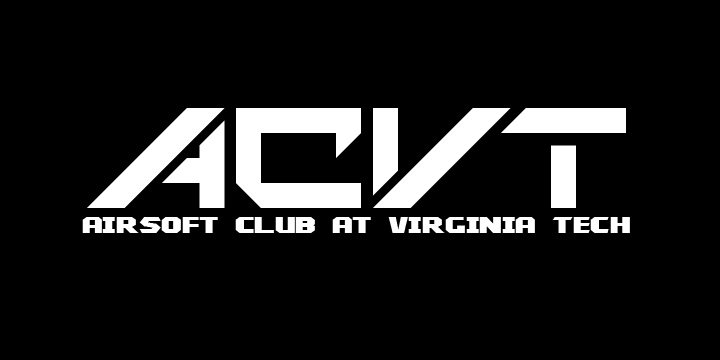 If you have any further questions please do not hesitate to contact an admin at our email address (airsoftclubvirginiatech AT gmail DOT com), our facebook page, or on here. If you are able to drive, please meet at the carpool spot. We've been having issues with getting everyone there due to lack of transport and it would really help out to have an extra car or two. I'll be there, but could I please get a ride and borrow safety equipment and an airsoft gun? I will be there. I can take 3 additional people, 4 if they don't mind a squeeze. If it means we get to have a game this week, I don't mind making two trips. lt doesn't take me that long to get to the field. If anyone has a couple M14 mags I could borrow, that would be great. I got you. Where in Foxridge do you want me to pick you up?